Dad's Homemade Pizza | Mealtime | Kids VT - small people, big ideas! 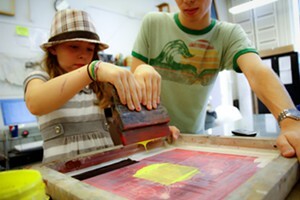 My husband, Sam, is a terrific dad, a talented photographer and a dedicated Little League coach. He's also an accomplished baker. Before we were married, Sam co-owned a pizza shop in Shelburne. For two years, he made about 50 pounds of pizza dough from scratch every day, and he got pretty good at it. One might even say he became obsessed with the alchemy of flour, water and yeast. I still dream of those years, when he would come home late after a long shift, smelling of dough and carrying still-warm boxes of my favorite pies: bacon-feta-caramelized onion or spinach-roasted red pepper-Parmesan. The shop didn't last, but our passion for pizza has endured. More than a decade and three kids later, we have Pizza Movie Night every Friday at our house. And while dinner is usually my domain, Sam is our chief pizza maker. In most families I know, one parent cooks the majority of the meals and the other whips up a few specialties. It's a stereotype, but many dads gravitate to the grill. Making dough is my husband's barbecue. In honor of Father's Day, Sam agreed to share his recipe for homemade pizza dough, plus two of our favorite Pizza Movie Night pies. Preheat oven to 200 degrees. Once it's preheated, immediately turn it off. Combine water, yeast and sugar in a large mixing bowl and stir. Let the mixture sit for 5 to 10 minutes, until the yeast has dissolved and foamy bubbles appear. This is known as "proofing" the yeast. The bubbles mean the yeast is active. If no bubbles appear, the yeast might be expired; start over with another packet. Add the olive oil and salt and mix. Slowly add in the flour, a cup at a time, mixing well, first with a wooden spoon, then with your hands when the dough starts to come together. Tip the dough onto a lightly floured surface and continue to knead for about 6 to 8 minutes, until the dough is smooth and elastic. Clean out your mixing bowl with hot water and dry it well. Coat the inside with a tablespoon or so of olive oil. Form the dough into a ball and place it into the bowl, turning it a few times to make sure it's coated with oil on all sides. Cover with a clean towel or plastic wrap and let rise for an hour in the warm oven. Once the dough has doubled in size, put your fist right into the middle to deflate it (this is known as "punching down" the dough) and turn it out onto your kneading surface. Knead once or twice, and then cut into three equal pieces for three large pizzas. Use the dough immediately, or freeze, wrapped in a double layer of plastic wrap, for up to 3 months. A freezer bag would also work. Just make sure you squeeze any air out before sealing. Combine the chicken-salad ingredients in a large mixing bowl. Prepare a pan with cooking spray or brush with olive or vegetable oil. Roll or stretch out the dough to fit your pan. We usually use a 12-by-18-inch baking sheet, but a pizza stone or 16-inch round pan will work, too. Brush dough with olive oil, then spread the chicken salad evenly on top, leaving a -- to 1-inch border around the edges. Top with the shredded cheddar and black pepper to taste. Bake for about 10-12 minutes, until the top is bubbly and the crust is crisp on the bottom and starting to brown. Let cool for a couple of minutes, then top with fresh arugula and serve. 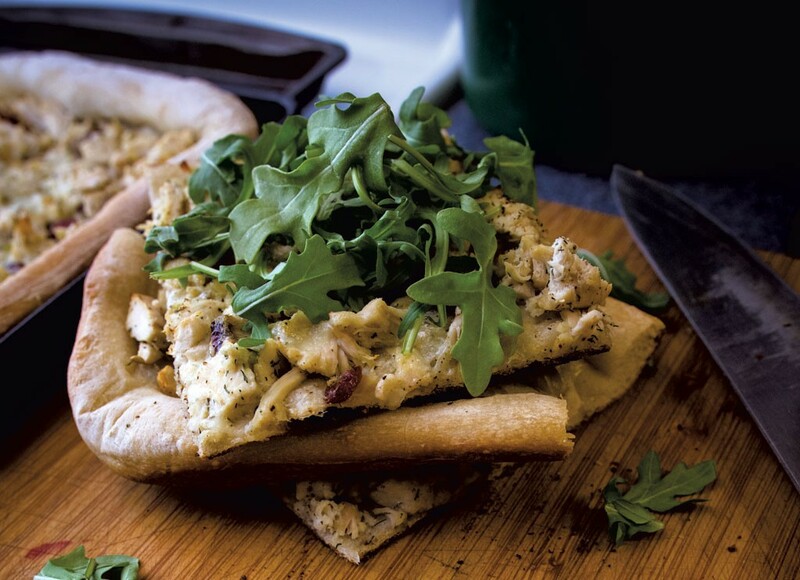 Stretch out the dough to fit your oiled pan, as explained in the Chicken Salad Pizza recipe. Spread salsa evenly over the dough. Sprinkle cheese over the salsa, then layer on the toppings, saving the cilantro and the salt and pepper for after the pizza has cooked. Follow Chicken Salad Pizza baking directions. When the pizza comes out of the oven, sprinkle cilantro over the top and add salt and pepper.